Board of European Students of Technology (BEST) is a student organisation, present in 93 universities from 32 countries around Europe. One of the local BEST groups is located in the Technical University of Denmark (DTU). The BEST group in DTU focuses on developing students in a fun international environment. The group is formed of 50% Danes and 50% international students, so for an international student it is a great way to get meet Danes and for a Danish student it is a very good opportunity to form a strong international network. We are organizing several events for other students – engineering competitions, training sessions, summer courses – every year. This way we develop or soft skills and get hands-on experience, as well as direct contact with companies. We also get to travel a lot in a very cheap way, by participating in BEST internal events – workshops, cultural exchanges, regional meetings – or going as co-organizers at events organized by other local BEST groups around Europe. This is a great opportunity to get to know other cultures and to expand our horizons. For example, in October this year we are going to Portugal for a week, as part of a cultural exchange. 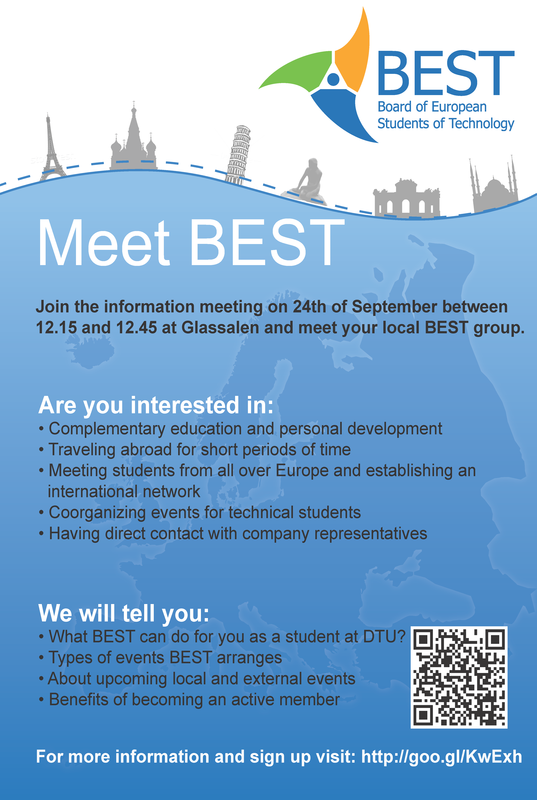 To hear more about BEST, join us on Monday the 24th September, during lunch break, in the Glass Hall (inside the cantine in building 101). Please sign up here. This entry was posted in Activities and tagged BEST, Copenhagen, development, DTU, Europe, flexibility, fun, info meeting, international network, September, student organization, travel. Bookmark the permalink.